We’d love your help. Let us know what’s wrong with this preview of RESTful Web Services Cookbook by Subbu Allamaraju. While the REST design philosophy has captured the imagination of web and enterprise developers alike, using this approach to develop real web services is no picnic. 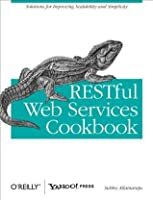 This cookbook includes more than 100 recipes to help you take advantage of REST, HTTP, and the infrastructure of the Web. You'll learn ways to design RESTful web services for client and server applications that While the REST design philosophy has captured the imagination of web and enterprise developers alike, using this approach to develop real web services is no picnic. This cookbook includes more than 100 recipes to help you take advantage of REST, HTTP, and the infrastructure of the Web. You'll learn ways to design RESTful web services for client and server applications that meet performance, scalability, reliability, and security goals, no matter what programming language and development framework you use. To ask other readers questions about RESTful Web Services Cookbook, please sign up. What do you guys recommend to read first? This one or the "RESTful Web Services"
Jeremy Boyd I'd definitely read "RESTful Web Services" first, because you need an understanding of basic REST principles before this book is very useful. An example of a book that hasn't aged too well - while most of the advice is still sound, most of it is now common knowledge. Also, some recipes are too dated for today's RESTful ecosystem, especially the reliance on Atom and XML. But all in all, an okay read, especially considering the publication date. A solid reference for anyone designing, implementing, and integrating web services. May be a bit dry, but helpful for this generation of developers! This book is not an introduction to REST. But if you are already aware of what REST is, and are looking for a set of solutions to implement it, this is a book you must own. Practical and useful, this is definitely a practitioners handbook. The only drawback (in my view) is that the examples are mostly in AtomPub, rather than in JSON or XML. This book is a great collection of recipes to cook your web services. Unfortunately it's a bit outdated, but from my perspective most of its parts are still relevant. It's sort of a book that's easy to read and easy to comprehend, i would recommend it to anyone who strives to build robust and scalable web apps. My experience with this book was similar to that described in Charles Bihis' review. I also read it cover to cover, and have found it useful for foundational reference. I highly recommend this introduction to RESTful web services for software engineers. Go to book for RESTful web services. As the book claims, it is a cookbook. Useful as a reference while developing RESTful Web Services. I liked the chapters on Security and Caching. This one is a very useful book, which describe pragmatic REST concept. I'm still reading this, but I think this should be essential reading for anyone writing or designing a remote API.